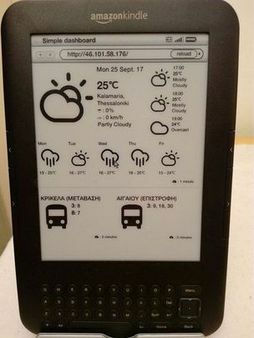 The Kindle dashboard was an attempt to capitalize on the beautiful e-ink display of the Amazon Kindle, which can be always on, to display relevant weather or transportation info. I wanted to have a device that didn't consume a lot of energy, that would always be on and provide live info. The Kindle e-paper is also such a nice screen to look at, easy on the eye and does not consume battery, unless it needs to refresh. Therefore, I made a django app that connects to the Dark Sky API to show weather info and the OASTH API to display information about bus arrival times from nearby stops. While displaying live information about weather and bus arrival times, it also shows the time since the last update for everything on the dashboard, so that the user can be sure that what he is viewing is up to date. There is also a weather forecast for the next week and the upcoming hours. Featured also on makerfolio.